I have fond memories of my early days on the internet. There was a dedicated community of bloggers, all of us around the same age, who would religiously comment on each other's posts. All young girls, passionate about our new craft of outfit posts and mood boards, which were produced almost daily. It was such a tight knit network, and I still value it. One of the most beautiful attributes of it was the anonymity. We knew each other's first names, blog URLs, and roughly where in the world we all lived, but we didn't really know each other. Yet it still felt like we were friends, maybe even outsiders banded together like a teen cliche, all communicating digitally through our love of art. It was really special. Things nowadays are a little different. Three years down the line, some of us still blog, most of us have grown up and are moving on to prospects such as higher education, three dimensional creative careers barely blossoming. But it's nice - we've grown up together. Through our small but special digital portals we've seen each other grow and change. I feel a sense of pride, even though we barely know each other IRL, watching us all move on in our lives. 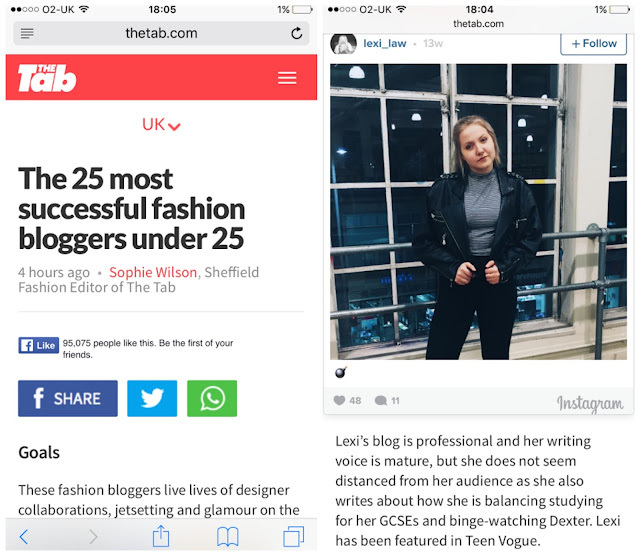 A good example of this was a recent article in The Tab, listing the 25 most successful fashion bloggers under 25. I was incredibly flattered to be on the list myself, but to be alongside so many other bloggers I've grown up with online or looked up to really was wonderful and a proud moment. Despite the fact we are all going in different directions, and are busier and more distant, most of us are still in contact via some form of social media. To celebrate my anniversary of blogging for three years, I've decided to ask three of my long-term internet pals three questions. This week it's Khensani of Glitter Daiquiri. Between her clever words and coloured eyebrows, Khensani has a unique charm online straight from South Africa. What do you remember about your early days of blogging as a teen? My early days were really silly. I think because I was certain that I was writing only to spam bots for the most part. I also didn't have a real sense of identity so my blogging was a cacophonous copy and paste of all the bloggers I admired and aspired to be. But it was probably the most fun, just stumbling around and making a mess and not worrying about having to maintain a certain message or constantly deliver a certain style and look and feel. What has changed for you and your blog over the last three years? My blog went from something I did to pass time, to something I wanted to turn into a business and become the next, I don't know, Chiara or Aimee and then a place where I expressed myself and curated my own web world. Now, I'm not blogging to fend of boredom or to pander to other people (not that the Chiaras and Aimees do that - but it is very easy to fall into the trap of blogging for fame). What is your forecast for the next three years? I am the worst person to ask about a future that involves more than the sun eventually swallowing the planet whole one day. I'm currently pursuing a fashion design degree, writing stories, making art, selling clothes, trying to live an examined life as well as hopefully stack degrees in philosophy, art history, political science and literature??? And get in a lot of partying and Sims 4 in between all that. Between running a badass vintage store, Glitter Betty, and writing on her blog, Khensani is definitely someone you should follow. Stay tuned for the next two instalments of this series. I love this post! It's weird, growing up on the internet and irl. So cool, though.